It took a week of back-to-back trials to find a yellow cake I loved, but I’ve made dozens of chocolate cakes over the past few years and can’t think of one that wasn’t great. The problem is that I still can’t pick a favorite chocolate cake! If only all of life’s problems were such. This weekend’s cake was part of my ongoing attempt to find an all-time favorite chocolate layer cake. Was this it? It’s a cocoa layer cake, in that the only chocolate used is unsweetened cocoa powder. This cake was posted by Katy in the Readers’ Favorite Cake Comment Thread I created a while back and resurrected this morning. The recipe calls for promising chocolate cake ingredients such as cocoa powder, butter, buttermilk, and a combination of brown sugar and white. It doesn’t have any coffee, but that would be an easy addition since the cake does call for a cup of boiling water. Another good thing about this cake was that the layers were thick. It was a 9 inch round cake made in two pans as opposed to 3, and I think I’m starting to like that higher cake to frosting ratio. This cake was dense and moist. The first photo the cake is cold so it appears even denser. But it was also quite moist at room temperature. Thanks to Katy for yet another great chocolate cake. The frosting is my new favorite and one I adapted from Southern Living. I added a little buttermilk instead of regular milk and it tasted pretty good. 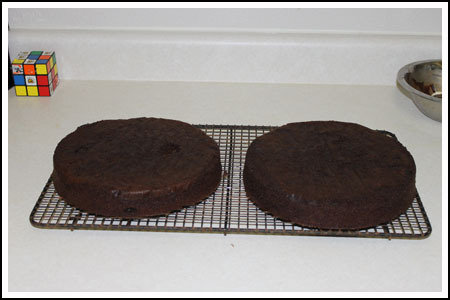 1: Preheat oven to 350 degrees F. or 325 F if using black cake pans. 3: Combine water and cocoa in a bowl and stir until smooth. Reserve. 4: Sift together dry ingredients. Reserve. 5: In large bowl of an electric mixer, cream butter and sugars. 6: Beat in eggs and vanilla. Stir buttermilk into cocoa mixture. 7: Add alternately with dry ingredients in 3 additions. 9: Bake 28-38 minutes (see note) or until a toothpick comes out barely clean. Cool and frost. Melt both chocolates in microwave, double boiler or bowl set over barely simmering water; set aside to cool. Beat the butter until creamy. Stir in the cocoa power, about a cup of the powdered sugar, and the cooled melted chocolate. Scrape sides of bowl and beat well; add remaining powdered sugar, then add milk, vanilla and salt, beating and scraping until you get the consistency you like. –I used dark pans and baked at 325 degrees F. Bake time was about 38 minutes. — The recipe makes a lot of batter and it comes almost to the top of two 9 inch round cake pans. To be safe, you might want to put a cookie sheet on the lower baking rack to catch any drips. I did, but luckily it didn’t drip. Looks like brownies almost, nothing wrong with that! I like dense and moist cake. I also like a really dark brown chocolate cake and frosting, can you give me some tips on how I can achieve it? Thanks! Thank you for this wonderful receipe. I am going to make this cake for my friends who are coming to visit this Saturday afternoon. I am sure they will love it. 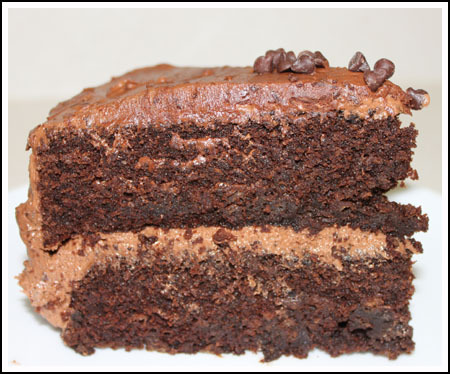 My go-to recipe for many years has been Hershey’s “Perfectly Chocolate” Cake and the “Perfectly Chocolate” Icing. It’s simple, moist, delicious and everything you’d want in a chocolate cake. I add a tsp (or two) of instant espresso to the boiling water. YUM! YUM, this looks great, Anna! I’m still experimenting and pouring over different chocolate cake recipes, myself. This one certainly looks promising and I think I will be trying it very soon! Wow, what a chocolate tower! 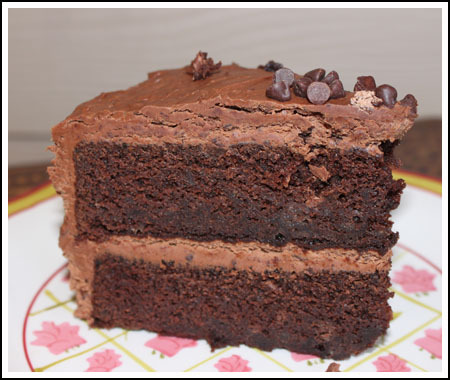 I have yet to find a rich, great texture chocolate cake that I LOVE. OMG, I’m dying for some chocolate right now and that did NOT help. Looks amazing. but this is my personal fav. I could use a piece right now, yum. wow, that cake looks amazing! Kim, that cake looks good! Thanks for the link. Interesting that it only has 1/4 cup oil. Jeanette, 7,866 people can’t be wrong. Wow. What I like about that cake is all the brown sugar. The story that goes with it is cute too. That looks really delicious and I just might have to try it! It looks almost “brownie” or “fudge” like in the pictures~ Yummy!!! Looks delicious. Reading through this recipe, it reminds me of my “go to” chocolate cake recipe which also includes brown sugar, cocoa, and buttermilk. I’ve wanted to try this with hot coffee in place of the boiling water but have not yet tried it. Bet the coffee would be good in either of these recipes.